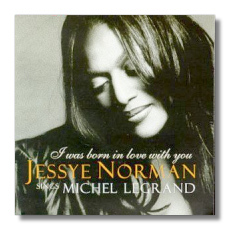 Norman's previous albums of high-class pop – one with John Williams as pianist, another with him conducting the Boston Pops – show that she glories in this repertoire. Given her affinity for France and things French, it is not surprising to see her turning her attention to the songs of Michel Legrand. Some are light and jazzy, others are full of pathos or creepily operatic. Norman seems most at home with the latter, although there's not a truly weak cut on this CD. Her voice no longer can do what it used to do in heavy classical music, at least not in concert halls and operatic stages. The right music under the right performing conditions still gives her the chance to make a mesmerizing effect, though, and such is the case here. It is obvious that she gave the same care to the preparation of these songs as she has given to songs by Schubert and Strauss in the past. She is accompanied by the composer himself – a prodigious pianist – and jazz greats Ron Carter on bass and Grady Tate on drums. Together, they create the perfect "late night jazz" ambience. Even Norman's voice at its most unfurled doesn't alter the impression of chic fatigue, emotional excitation, cigarette smoke, and expensive brandy. Many Legrand favorites are here. "The Windmills of Your Mind" is done in French as "Les Moulins de mon coeur," and you'll also find "The Summer Knows" (the theme from Summer of '42), "Les Parapluies de Cherbourg" (also known in English as "I Will Wait for You"), and "What are You Doing for the Rest of Your Life?" The songs are done in their original languages, a choice I have no problems with. Eight are in French, and seven, with lyrics by Alan and Marilyn Bergman, are in English. The booklet includes the sung texts, but no translation of the French. I would rather have had translations than the breezy and sycophantic essay by Mike Zwerin that takes up four pages. It's the only thing about this CD that I didn't enjoy. For end-of-the-day listening, I Was Born in Love with You is a real treat.